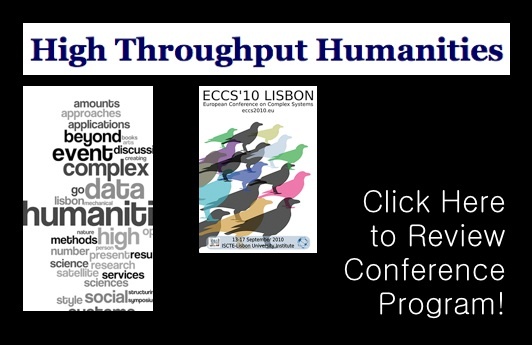 “The High Throughput Humanities satellite event at ECCS’10 establishes a forum for high throughput approaches in the humanities and social sciences, within the framework of complex systems science. The symposium aims to go beyond massive data aquisition and to present results beyond what can be manually achieved by a single person or a small group. Bringing together scientists, researchers, and practitioners from relevant fields, the event will stimulate and facilitate discussion, spark collaboration, as well as connect approaches, methods, and ideas. The main goal of the event is to present novel results based on analyses of Big Data (see NATURE special issue 2009), focusing on emergent complex properties and dynamics, which allow for new insights, applications, and services. With the advent of the 21st century, increasing amounts of data from the domain of qualitative humanities and social science research have become available for quantitative analysis. Private enterprises (Google Books and Earth, Youtube, Flickr, Twitter, Freebase, IMDb, among others) as well as public and non-profit institutions (Europeana, Wikipedia, DBPedia, Project Gutenberg, WordNet, Perseus, etc) are in the process of collecting, digitizing, and structuring vast amounts of information, and creating technologies, applications, and services (Linked Open Data, Open Calais, Amazon’s Mechanical Turk, ReCaptcha, ManyEyes, etc), which are transforming the way we do research.